Bill Simons and Carston Farmer made a great Python script that created Delauney triangulations and Voronoi diagrams from a set of input points. In my experience however, it was not entirely intuitive or straight forward how to send over your data points, and the results were not immediately usable and required a bit of processing before you could treat them as regular GIS polygons. Also, their script was not up on PyPi and did not have a very Pythonic API syntax either. So with a few touch ups I built on their script and released a new Pytess tesselator package on PyPi! Go ahead and pip install pytess or check it out on GitHub! 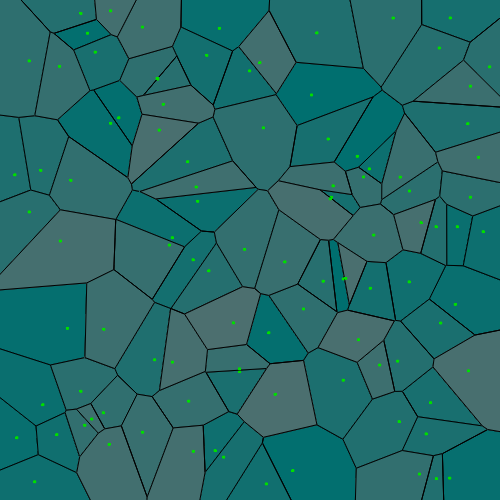 I am a student at RWTH aachen Germany and new to the spatial tesselation field, I would like to know, is it possible to implement multiplicatively weighted voronoi diagram with this package? if not do you have any advice about other software where I can implement? Hi. Im not too familiar with the algorithm used, as the package is only a wrapper around bill simons and carson farmer’s code. But from a quick google, i dont think there is support for weighted voronois as i understand it, there is no option to let point weights affect the shapes of the voronoi, only the distribution of the points decide that. Dont know of any other package either at current.